We’d love your help. Let us know what’s wrong with this preview of Reformed Dogmatics Volume 1 by Herman Bavinck. In partnership with the Dutch Reformed Translation Society, Baker Academic is proud to offer the first volume of Herman Bavinck's complete Reformed Dogmatics in English for the very first time. Bavinck's approach throughout is meticulous. 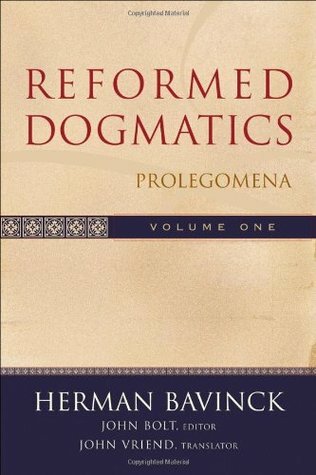 As he discusses the standard topics of dogmatic theology, he stands on the shoulders of giants such as Augustine, John Calvin, Francis In partnership with the Dutch Reformed Translation Society, Baker Academic is proud to offer the first volume of Herman Bavinck's complete Reformed Dogmatics in English for the very first time. To ask other readers questions about Reformed Dogmatics Volume 1 , please sign up. Is it wrong for a prolegomena to dogmatic theology to be your favorite book in the whole wide world? Well, if it is, then I don't wanna be right! I'm hoping to try to finish the set before the end of 2015. Remarkable. Astonishing breadth of sources with a pastoral focus. It maybe goes without saying, but a rich Prolegomena like this ought to be required reading for all pastors and students. Maybe not Bavinck, but *something*; but oh that I wish they would read Bavinck! A few years ago, I read two of the volumes from Will Durant's "The Story of Civilization" series. I loved their epic flavor and grand vision in to so much specific details of history! Well, in the area of Prolegomena (first things) and Reformed dogma, Bavinck creates the same kind of panorama, a beautiful landscape of the history and significance of each of the major schools and philosophers and theologians and how they have affected the church throughout history. The detail is rich, the scope is A few years ago, I read two of the volumes from Will Durant's "The Story of Civilization" series. I loved their epic flavor and grand vision in to so much specific details of history! Well, in the area of Prolegomena (first things) and Reformed dogma, Bavinck creates the same kind of panorama, a beautiful landscape of the history and significance of each of the major schools and philosophers and theologians and how they have affected the church throughout history. The detail is rich, the scope is well presented and clearly thought out, and the "ride" is fabulous! In addition to the historical component, Bavinck clearly and specifically delineates a presuppositional and Reformed Christian dogma that is detailed and understandable. His insight that religion by necessity must be based upon revelation, and not upon an intellectual rationalism, nor a demonstrable empiricism, is an important distinction that is all too easily dismissed today by those who incorrectly want to make the knowledge of God to be something that can be independently reasoned or derived, or something that is independently measurable. It is refreshing to read Van Til before Van Til. The influence on Van Til by men like Bavinck definitely had a great influence on Van Til's whole approach to theology, apologetics, etc. Bavinck was presuppositional through and through in this volume. He interacts well with all the current movers and shakers of his day. About the only downside to Bavinck's theological prolegomena is that he comes across as being way to enamored with the "science" of this or that theological issue. It's as if the It is refreshing to read Van Til before Van Til. The influence on Van Til by men like Bavinck definitely had a great influence on Van Til's whole approach to theology, apologetics, etc. Bavinck was presuppositional through and through in this volume. He interacts well with all the current movers and shakers of his day. About the only downside to Bavinck's theological prolegomena is that he comes across as being way to enamored with the "science" of this or that theological issue. It's as if the Dutch were trying to gain the respect of the Germans by talking about the science of religion, or the science of theological prolegomena, or the science of theological encyclopedia, or the science of biblical criticism. In doing this, I think the majority of these 19th century theologians lost the art of theology. Theology is more of an art than a science. Still mulling over whether I agree with Bavinck on some details about the internal ground of faith, but otherwise, this is a monument to Bavinck's learning, an example for what Reformed and evangelical scholarship can be, and an excellent defense of Reformed views on theological method and revelation. Highly recommended. It is finished. And no review that I am capable of writing can do justice to how good this was. Excited to get Volume 2! This volume is a master class in the discipline of Theological study. Bavinck carefully explains what many would simply assume. He thoughtfully engages with the great minds of history, and places the discipline of Dogmatics on solid ground amongst the other sciences. He grapples with big ideas, but chooses to use language that is accessible to the common man. This is an engaging read and has me hungry to continue into volume 2. Volume 1 and 3 to go. "The revelation that Scripture discloses to us does not just consist in a number of disconnected words and isolated facts but in one single historical and organic whole, a mighty world-controlling and world-renewing system of testimonies and acts of God". This is an outstanding presentation of the foundational principles of theology. In particular, the section on the attributes of Scripture is fantastic. 2014 Fall. Thrilled by the first 100 pages, but I haven't the time I need. Maybe next summer. Bavinck's systematic is excellent. He's opperating out the Dutch Reformed tradition. He influenced Vos, Van Til, and Kline, among others. Herman Bavinck has a way with P-r-o-legomen-a. I was first introduced to Herman Bavinck was in my first year in seminary. The class was a systematic class called “God and Humanity.” IWe read excerpts from Volume 2. A couple guys wanted to continue reading him so we met together the next semester weekly to discuss readings from Volume 1. To me, Bavinck is a CS Lewis type of writer - he writes profoundly and succinctly with I was first introduced to Herman Bavinck was in my first year in seminary. The class was a systematic class called “God and Humanity.” IWe read excerpts from Volume 2. A couple guys wanted to continue reading him so we met together the next semester weekly to discuss readings from Volume 1. The translation of Bavinck is exceptionally clear and the flow of thought is captivating. One will have to peruse quite a bit of the author wrestling with the theological challenges of his day, some are unfortunately still relevant, others not so much. Yet, it is deservedly called a classic and a must read for all pastors and seminary students. Challenging read, but really excellent. Very good. I learned a lot from this Volume. The chapter on the inspiration of scripture was very good. His discussion of special and general revelation was also very good. Excellent and thorough treatment of the first principles of theology. Interacts heavily with modernism and is historically grounded. Bavinck’s project consists of drawing upon the strengths of the Magisterial Protestants while formulating theology in response to the modernist crisis of his day. To do so, he realized he could not slavishly mimic older platitudes and simply “hope for the best.” Bavinck represents a very exciting yet somewhat embarrassing hero for modern Calvinists. Exciting, because his work is simply awesome and coming into English for the first time ever. Embarrassing, because modern Calvinists generally disl Bavinck’s project consists of drawing upon the strengths of the Magisterial Protestants while formulating theology in response to the modernist crisis of his day. To do so, he realized he could not slavishly mimic older platitudes and simply “hope for the best.” Bavinck represents a very exciting yet somewhat embarrassing hero for modern Calvinists. Exciting, because his work is simply awesome and coming into English for the first time ever. Embarrassing, because modern Calvinists generally dislike the movement “neo-Calvinism,” yet Bavinck is the unofficial godfather of it. Bavinck takes the traditional terminology of principia, yet in the background is an ever-present urgency to respond to modernism. Therefore, he takes the terminology and reframes it around the neo-Calvinist slogan, “Grace restores Nature.” There is an antithesis and dualism, to be sure, but it is not between nature and grace, but sin and grace. God himself is the principle of existence for theology (principium essendi). Objective revelation of God in Christ is recorded in the Scriptures and this is the external source of knowledge (externum principium cognoscendi). The Holy Spirit is the iternal source of knowledge. This leads Bavinck to a line he repeats throughout the book: there must be a corresponding internal organ to receive the external revelation. This anticipates the later Reformed Epistemology school. Contrary to the convertskii, everyone’s reception and evaluation of his or her ultimate authority will be subjective in some sense. One often hears the refrain, “You Protestants make yourself the Pope and judge of authority while we simply submit to the Church.” Unfortunately, at one time this convertskii had to make a decision–using his own sinful Western-influenced reason–between Rome, EO, Assyrian Orthodoxy, Monophysitism and Nestorianism. Whatever the external source of knowledge-the Church, God’s Revelation, etc.–the religious subject will have to respond to it. Since the subject is responding, the response and evaluation is, quite naturally, subjective. Bavinck hits a grand slam on this point. Bavinck does not try to hide the fact of circular reasoning. He asserts, quite rightly, that first principles in any science are by definition circular. If they were proven by other principles, they would not be first principles! With this acknowledged, Romanism and Orthodoxy are in no better position than Protestantism. Positing either the Pope or the Church as the external principle of knowledge is highly laughable–and bears witness to my argument given that few even try to do that. It’s obvious that Van Til read Bavinck. It is also obvious, if perhaps less so, that the Reformed Epistemologists follow in Bavinck’s train. It’s interesting that while Van Til drew heavily from Bavinck, I don’t think they are always saying the same thing on apologetics. Bavinck used the categories of presuppositionalism, but he knew when to stop the train. I think he kept himself from many of what would later be some of Van Til’s errors, or at least weak points. Skipped chs. 3-7, 13, 15. Bavinck is very thorough and sometimes the references can seem overwhelming, but his insight and content is fantastic. This is an extraordinary introduction to systematic theology, or reformed dogmatics. It starts with some very heavy material on philosophy and there are many references to a number of philosophers and theologians that I am not familiar with. This made for a rather tedious start to this volume. But there are definitely gems throughout even these introductory chapters, which form a good foundation for what comes later. The last couple of chapters were especially helpful to me. The nature of God's r This is an extraordinary introduction to systematic theology, or reformed dogmatics. It starts with some very heavy material on philosophy and there are many references to a number of philosophers and theologians that I am not familiar with. This made for a rather tedious start to this volume. The last couple of chapters were especially helpful to me. The nature of God's revelation and the place of faith in the life of a Christian were very encouraging. This is a wonderful treatment of the reformed church doctrines. This is the first book of four. I have read all four last year and have started going through them again. Highly recommend. Bavinck goes through the different views...Roman Catholic, Lutheran, Reformed, Baptist, and also many philosophical opinions. An incredible book that's actually pretty easy to read given the fact that the translation into english is fresh. Bavinck interacts with philosophies and theologians all across the spectrum of the prolegomena to theology, showing their strengths and weaknesses, while always setting forth a positive view of the truth of Christianity in the midst of it all. Com certeza, a introdução à Teologia Sistemática mais elegante que já li! O conhecimento de literatura primária e secundaria de Bavinck é impressionante. Uma obra densa, mas agradável de se ler. Herman Bavinck (1854-1921) succeeded Abraham Kuyper as professor of systematic theology at the Free University of Amsterdam in 1902.